When you want your jewelry to stand out from the crowd, it's important to use unique beads and components. Many bead stores don't carry artisan beads, and ordering online can be expensive. Instead, you can make your own one-of-a-kind beads and components with polymer clay. In this comprehensive tutorial, I take you through every step and show you how to make textured beads and components without using expensive texture sheets and molds. Make your Rustic Beads in any color to match the theme of your jewelry. This is a very forgiving technique that gives great results no matter what your experience level. Even if you've never worked with polymer clay before, now's your chance to get started. If you can mix clay in your hands, you can have success with this tutorial. No pasta machine or special tools are required. This is such an easy and enjoyable technique that I've been told it's almost addictive. Once you start, you can't stop making them! The Rustic Beads Tutorial is 41 pages long and contains 82 photographs. This is a beginner level tutorial that requires no previous polymer clay experience. I don’t, however, cover the basics of working with polymer clay, so if you’re new to this material you might want to add my Polymer Clay Essentials eBook to your order. No special materials are required for this tutorial. You likely have everything you need at home already, or you can find it at your local discount store. Plus you’ll need polymer clay, of course. It’s a great way to use up scrap clay. Designed to compliment the Organic Beads Tutorial, the shapes of this tutorial can be colored using the methods explained in the Organic Beads Tutorial, and vice versa. Text and images in this tutorial are Copyright © 2013-2017 by Ginger Davis Allman, of The Blue Bottle Tree, all rights reserved. That means you can’t share this tutorial, teach or give it to friends, post the file or contents online, or sell it, etc. However, your creations are always yours to sell, share, and enjoy as you desire. I always appreciate credit and a shout-out whenever possible. Thank you! All of the tutorials by The Blue Bottle Tree are fabulously well-written, easy to follow, and with just the perfect amount of illustrative photos. This rustic beads tutorial is my favorite. The technique has endless possibilities to make it truly your own and it has inspired me to start making more of my own components and beads. This is a must have if you’re a fan of rustic jewelry. I LOVE this tutorial. The photos are great and the tutorial itself is thorough and well-written. The techniques Ginger outlines in this tutorial really gave me a creative boost. I’ve applied these techniques over and over again in my work – this tutorial is well worth your money. This is the only tutorial that I’ve purchased from Ginger, but I’ve used it with many colors of polymer, two different brands, translucent as well as opaque. I’ve added pearlescent powders, embossing powders, pulverized chalks and pastels and eye shadow. I put polymer clay handles on buttons to make them easier to use and I’ve started cutting little stamps out of flat white erasers instead of using buttons. Each time I start to use the tutorial I come up with more ideas for making these beads my own. Pretty much the sign of a good tutorial! All of the tutorials I have purchased from Ginger have been incredibly well written. She has a curious mind and leaves no stone unturned. I often return to her tutorials just to look a little something up or to refresh my memory. I have learned so much about polymer clay from her that I can absolutely tell you that each of her tutorials are well worth the rather small price she charges! Plus, she’s always available to answer questions. I don’t know what to add to what the ladies above have said, but this is the first of Ginger’s tutes I ever got and I love it! there are so many great ideas here that are fun. I learned a lot from this tutorial and I get it out to get inspired and re-play with the many possibilities! Worth the money for me for sure! This was the the first (and only so far but not for long) tutorial that I purchased from The Blue Bottle Tree. I am extremely new to polymer clay but extremely into rustic design so I gave it a whirl. This tutorial is absolutely amazing! It is so well written and unbelievably descriptive, including a number of pictures that are most helpful. I will definitely be trying out some of the other tutorials soon!! This tutorial is very well written with lots of pictures. I had lots of fun trying all the different effects that were shown. I had so much fun making the beads in this tutorial. Easy to follow and would be great for all levels from newbie to experienced! Ginger’s tutorials are easy to follow and give comprehensive instructions and options for variations. Highly recommended for anyone wanting a low pressure, fail proof and above all fun to do tutorial! I think I have all of Ginger’s tutorials. I absolutely love them. There’s no second guessing all of the information is there. These tutorials take the guess work out of working with polymer clay. So if your looking to “get into your clay” take the time out to purchase at least one of Ginger’s tutorials and I bet you go back and purchase the rest. As is the case with all of Ginger’s tutorials this one produced excellent results. They are always so well-written and illustrated they are a pleasure to use. Another great tutorial. 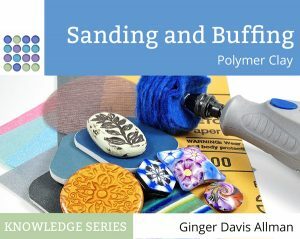 Ginger will have you taking your polymer clay in a different direction after you see what happens in this tutorial and you will be digging out supplies that you never thought you could use. More fun and creative learning. Thanks Ginger, having a blast! I leaned lots from this tutorial & had fun!! This is one of my “go to” tuts. I never get tired of it. Ginger has provided a wealth of information that can be applied to other projects as well. Very well written and easy to follow, all levels of Polymer Clay artists will learn from it. Well written with beautiful photos, easy to follow and very inspiring what more could you want! Awesome tutorial! Clear, precise instructions, step by step instructions and pics. I totally luv rustic beads and this is the perfect tutorial! I highly recommend it!! Great tutorial. Clearly presented and wonderful explanations and pictures. Highly recommended and very inspiring. Ginger’s tutorials are absolutely wonderful. The three that I have purchased look as if they should be published in a book. Ginger uses her scientific background along with her artistic and teaching abilities, to create these wonderful tutorials. Her illustrations in the tutorials are so detailed which makes it easy for you to create your own variations that are very unique. I have reviewed aproximately 50 polymer clay tutorials over the years and keep coming back to Ginger’s as my favorites. Additionally, she has answered so many of my questions, even when they involved computer issues. Please purchase her tutorials. You will not be dissappointed! I will have to repeat what others have said about Ginger’s tutorials; they are absolutely splendid. This tutorial on rustic beads, my favorite, is packed with step by step information including pictures to help you along the way. Highly recommended for the beginner or someone more experienced who is looking for alternative variations in working with clay. I love Ginger’s tutorials, beautifully written and illustrated. I have a good friend who wants me to make rustic beads for her supply shop. I said “HA! I know just where to go to learn to make them!” thank you Ginger! Thank you so much for such a great tut!!! This is my first tutorial from Ginger, and I am very impressed! It is thorough, well-written, and nicely illustrated. I see more Blue Bottle Tree tutorials in my future! Thanks, Ginger! Iam very happy with the tutorial lots of information and colored examples, this will be number 3 tutorial all very good. This is a terrific tutorial, well written, clear instructions, with plenty of room left for your own personal touches. I can’t stop making these (I have tons of scrap clay to use up). To be honest the beads are surprisingly time-consuming with all the layers and the baking and the polishing, but I have so much fun with these I don’t care. Whenever I can’t figure out what project to tackle next I reach for this tutorial. I highly recommend this for anyone wanting to have fun making beads and components. I have several of Ginger’s tutorials and they are all fabulous. She tests and researches all of her information. It is given to you in a fun, laid back way. You’ll laugh as well as learn. They are filled with lots of pictures and clear, concise instructions. And if you do have any questions, Ginger will be there to answer them for you. I will choose a dented, scuffed, dirt encrusted treasure over something new any day. Her rustic beads tut is one of my favorites. The techniques are simple, but they make a huge difference. I made a lot of beads following her instructions exactly. They came out great. Then I was looking at some pendant pieces I had lying around my table. They hadn’t come out quite how I’d wanted and I didn’t know what to do with them. I thought, what the heck, and I distressed them too. It made such a difference. They don’t even look like the same pendants. This is now my go to technique if a piece isn’t doing what I’d planned! Thanks Ginger!! As usual, this tutorial is just packed with information. I’ve started it but haven’t even gotten through it yet. I always get more than I expect with Ginger’s tutorials. Just like all of her tutorials, the techniques can be used in many different ways, beyond the projects she mentions. They are always easy to follow and detailed. Thank you. Looking forward to trying this. I enjoyed doing the Rustic Beads tutorial because I had gotten in a clay ‘slump’ and this kick started me again! As with every tutorial I have taken from her, Ginger’s instructions were ‘spot on’. I picked up some new ideas along the way also, and that’s always good These beads are very ‘forgiving’ and a lot of techniques can be used. I look forward to getting even more tutorials from Ginger. Ginger’s Rustic Beads Tutorial goes beyond showing you how to make a rustic bead. It is stuffed with techniques that you can easily apply to polymer clay outside the realm of beads, including distress effects and sealing pieces. The information provided for turning your pieces into wearable jewellery is invaluable, including instructions for making headpins, connectors with loops- even how to drill holes! This is more than just a tutorial for me- it is a reference guide. Worth every cent and highly reccommended. Another great tutorial. So much info that can carry over to other projects! She never disappoints! Loved it! Nice easy instructions, great photos. My beads turned out great! Like all Blue Bottle lessons, this is very comprehensive. It is simple to use and the instructions allow you to expand on the final results. This tutorial just keeps on giving. I make my own beads for handmade journals, focal, driftwood mobiles, and more. This technique is my favorite to create unique beads every time. The tutorial is very well written and very easy to follow. I find Ginger includes every detail required to complete the project. Highly recommend getting these tutorials. Excellent tutorial. Lovely designs, great techniques and ideas; well written and very informative. Thank you!! I love, love, love this tutorial! It is well written, and easy to follow. Wonderful techniques and ideas to carry over to your style. Very inexpensive for all the information the tutorial has. Thank you Ginger! This is a great tutorial, easy to follow and very clear pictures. It is also a great way to use left over pieces of clay and it is easy to see all the possibilities for both texture and pieces you could make using this technique. Let me tell you that – Ginger has amazing way of writing, no matter if it’s a tutorial or article, review or a book. Her tutorials are very clearly written, understandable and with a lot of HD pictures. The rustic Beads was the first tutorial I bought and I fell involve with it. It’s really fun and the whole tutorial boosts your imagination. It’s definitely a must to have. Also this incredible technique is so easy to achieve, that you will be surprised!